Lawns have their place – there’s nothing like them for kid play, for croquet, for walking barefoot on the grass – but that doesn’t mean they should be all over the place! Perhaps you are tired of mowing your lawn. You want to save water and create habitat for native birds and butterflies. And stop using fertilizers, pesticides and herbicides. You want to do all that good Earth-friendly stuff. Many people have no idea what to put in place of their lawn, so here are some ideas to get you started. First think about your personal style. Any of these can be executed using California native plants: Asian/Japanese/Zen, Modern/Contemporary, English Cottage/Perennial Border, Woodland, Formal/European/Italian/French, Mediterranean, and (my personal favorite) Eclectic. Your drought tolerant garden will benefit if you can keep all of the water that falls on your property on-site. Whatever style you choose, you may want to incorporate some of the following ideas and themes. I offer these to encourage you to escape from the monotony of lawns! A meadow conjures images of a grassy field filled with wildflowers, and you can create that at home. Meadows require a different mind-set than a lawn, as they don’t look the same all year long. The seed heads sway in the breeze, flowers come and go, and there may be a dormant period. To get a meadow established you must control the competing weeds, including invasive European annuals like foxtail and wild oats and perennials like oxalis and Bermuda Grass. You should start by pre-germinating and then killing the weed sprouts, and then controlling them as they come back. Decide whether you want a bunch grass like leafy reed grass (Calamagrostis foliosa) or California fescue (Festuca californica), which would allow some flowers to be interplanted, or a mildly running grass like red fescue (Festuca rubra) or dune sedge (Carex pansa), which eventually chokes out the flowers and creates a more uniform appearance. Some grasses are available to plant from seed and others are only available by plugs or larger plants. Just recently, several mixtures of native meadow grasses have become available in sod form. Many of the valleys we currently inhabit were once meadows of deep-rooted perennial grasses, and it takes a bit of time to bring them back, so be patient and persistent! Although an herbal lawn made of yarrow (Achillea millefolium) (for sun) or yerba buena (Clinopodium douglasii) (for shade) has the same down-sides as any monoculture, it is more drought tolerant than a turfgrass lawn, and doesn’t require weekly mowing. You can occasionally walk on these plants, but regular foot traffic should be diverted to a path or stepping stones. Yarrow should be cut back after blooming. Thrift sea pink (Armeria maritima) can be a showy and unusual “lawn”, as well. Here’s a way to cover a large expanse without a large expense, I think this is the least expensive strategy. Fast growing plants like Ceanothus ‘Yankee Point’ or bee’s bliss sage (Salvia ‘Bee’s Bliss’) can cover an 8 foot wide area within two years! This chokes out weeds and creates a large uniform planted area, that can contrast beautifully with taller accent plants. Hardscape is the landscaping term for all the areas that aren’t soil and plants – the patios, decks, paths, walls, etc. May I put in a pitch for permeable hardscaping? 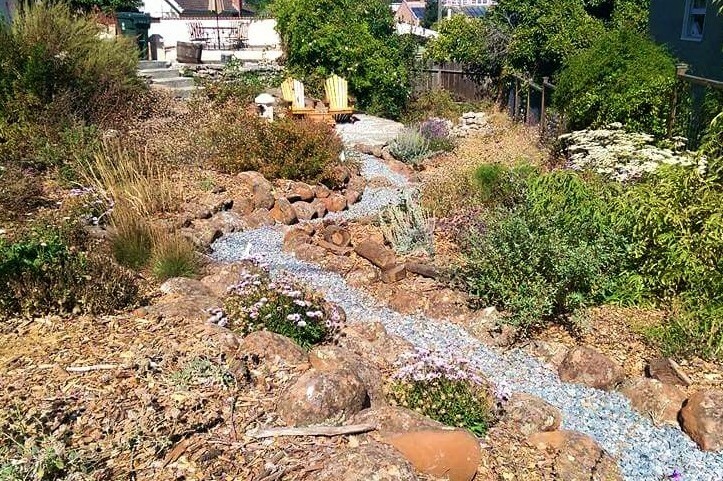 Your drought tolerant garden will benefit if you can keep all of the water that falls on your property on-site. Instead of concrete, consider pervious concrete and pavers, decomposed granite, gravel and mulch. Once you have decided to make the environmental switch to a lawn alternative, you are ready to think about how to remove that lawn…and that’s the subject of another article. Deva Luna works for a sustainable landscape contractor, EarthCare Landscaping, in Cupertino, California, and loves to replace lawns with native plants.